The ETH/USD loses the $100 and opens the door to further new lows. The BTC/USD is holding on and it’s struggling to regain the support that it has lost. The ETH/BTC also sets new annual lows and delays the upside scenario. In the late hours of yesterday’s European session, the main players on the Crypto board failed to meet their respective support levels. The ETH/USD sets new annual lows leaving the tick at the $95.17 price level. This new annual low reached yesterday. The ETH/BTC also lost supports, and the Ethereum marked its lowest moment against Bitcoin this year. As I have published several times, the Ethereum performing better than Bitcoin is a pattern that has always matched a bullish market. After the new low reached yesterday, the MACD in the daily range slides back down, and the DMI shows very active Ethereum sellers. The positive thing is that the D- ( a component of the DMI that indicates the tendential strength of the Bears) goes directly towards the ADX (a component of the DMI that represents the tendential strength of the price) coming from below. If when the D- impact with the ADX, it bounces downwards, we may have a change of trend. Add up the two above paragraphs, and you will see how satisfying it can be to observe the ETH/BTC chart. 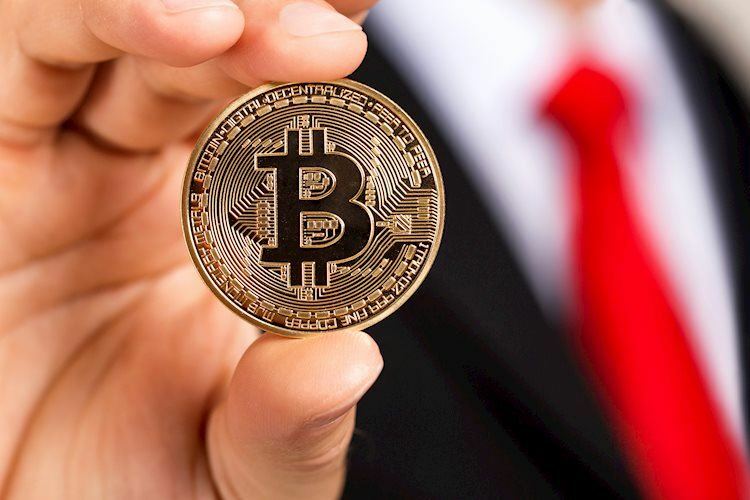 The 240 Minute BTC/USD recovers at the European opening to the $3,820 price level but fails to regain the $3,930 support level. Below the current price, the first support is at the annual lows of $3,466. If the BTC/USD reaches and pierces down this price level, the second support is at $3,262 (price congestion support). From this level of support, the BTC/USD may attempt to seek lower levels and drill the $3,000 to go to the third level of support at $2,890 (price congestion support). Above the current price, the first resistance is at $3,930 (price congestion resistance). From this resistance level to the next at $4,400 are the EMA50 at $3,973 and the SMA100 at $4,082. This zone is, therefore, the main level to conquer to consolidate any bullish trend in the short term. The MACD at 240-Minutes shows a bullish cross profile but with a significant bearish inclination. This structure supports a bearish scenario in the terminal phase. The 240-Minute DMI shows us the Bulls reacting to the discounts offered yesterday. The Bears are not confident of the movement and seem to retreat from the battlefield. The XRP/USD is now trading at the $0.3429 price level. 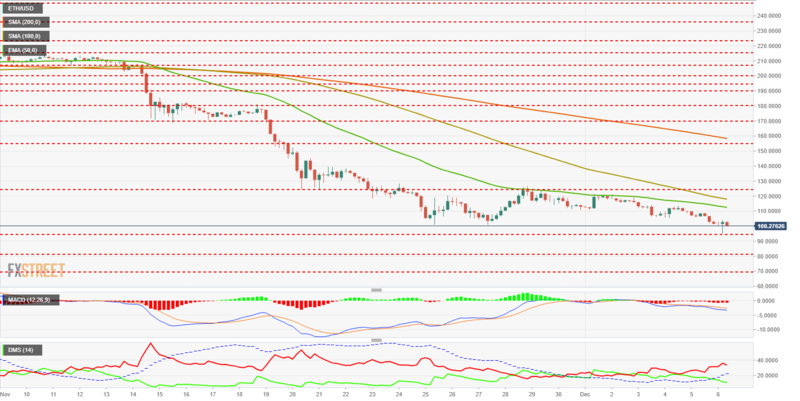 Yesterday’s decline caused it to lose the support level at $0.345. Today it has missed its first recovery attempt. Below the current price, the first support level for the XRP/USD is $0.32 (price congestion support). The second support level is $0.297 (price congestion support). Third level support at $0.27 (price congestion support). Above the actual price, the first resistance is at $0.345 (price congestion resistance). If the XRP/USD gets this price level back, it would have the EMA50 ahead by $0.3619 as an obstacle previous to the second resistance level at $0.368. Likewise, to continue rising it would have to beat the SMA100 by $0.383 before targeting the third resistance level by $0.413 (price congestion resistance). The MACD at 240-Minutes shows an ultra-flat profile that does not report any information. The 240-Minute DMI shows us in the XRP/USD case how the Bulls have not taken advantage of yesterday’s reasonable prices. They are not at all convinced to buy at the moment. The Bears for their part, remain at moderate levels of activity, without increasing their intensity. The ETH/USD is now trading at the $102.65 price level. It has lost its psychological level of $100 during the Asian session and left the annual low at $95.17. This price level is one of the supports that I have been pointing out for the last few weeks. Under the current price, the first level of support is at that new level of annual lows and at the same time support created by price congestion. For now, this price level halted the fall. The next support level is at $81.5 (price congestion support). The third level of support is at $70 (price congestion support). 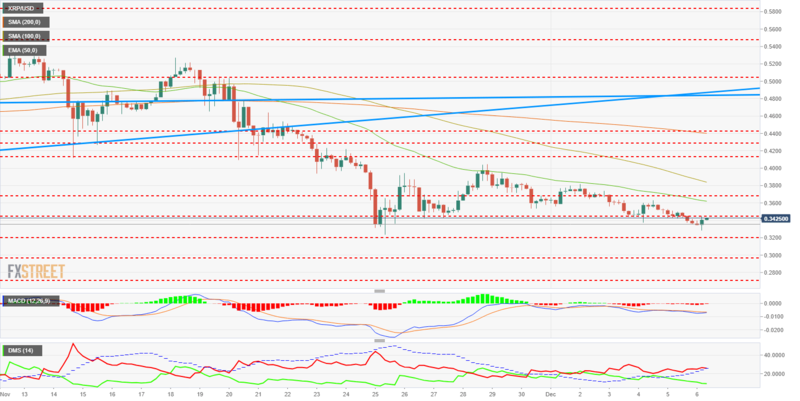 Above the current price, the first resistance is at $125 but to reach it the ETH/USD will have to exceed the EMA50 at $112.53 and the SMA100 at $117.93. The next resistance level is at $155 (price congestion resistance) and already very close to the SMA200 at $158.64. The MACD shows a profile which is close to the bullish cross but with a significant downward inclination. The DMI at 240 Minutes shows us how the Bulls continue with the retreat started two days ago. On the other hand, the Bears are very trustworthy and raise the level of intensity to a maximum of two weeks.